For a long time Intune admins have been logging into the Intune service dashboard at https://status.manage.microsoft.com/ to check on the status of their service. From there, you could easily review maintenance window timeframes and know when updates to the service are going to be applied. Of course doing this meant that you had to remember multiple portals and websites to help manage your Intune tenant along with all your other cloud services. In response to feedback to make getting to this information simpler, the Intune status information was moved to the Message Center of the Office 365 Admin portal back in late April of this year. Now that the service updates have started showing up in this new location, the old Intune service dashboard is being retired. With these changes there are now a few ways to find information about the health of your Intune tenant and about when updates are going to be applied. I’ll show you how in this post. Having some issues with the Intune service and wondering if it’s something you are doing or if the service is has gone temporarily wonky? Just log into the Office 365 Admin Portal, expand the Health node, and select Service Health as shown below. 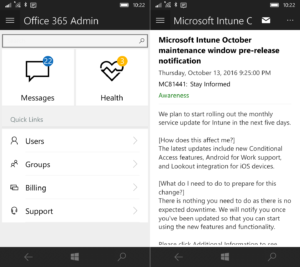 If there is a known issue about the Intune service, you’ll be able to learn more about it from here. Tip: to learn about what feature updates are going to be applied, just click on the Additional information link from the message contents. That will take you to the Intune What’s New information to get a deeper understanding of the new capabilities soon to be at your fingertips. That article is updated each month so go ahead and bookmark it now for later reference: https://docs.microsoft.com/intune/whats-new/whats-new-in-microsoft-intune. What makes this app even better is that in addition to reviewing service health and change notifications, you can also actually do some service management using it. You can add users, reset passwords, and even assign licenses. Having a problem and need to open or review an existing service ticket? You can do that on the go with the app too! You can learn more and download the app from here. Finally, you can take custom service notifications to the next level using the Office 365 Service Communications API. Leveraging this API enables you to develop your own internal dashboards and reports without the need to visit the actual Office 365 Admin Portal. 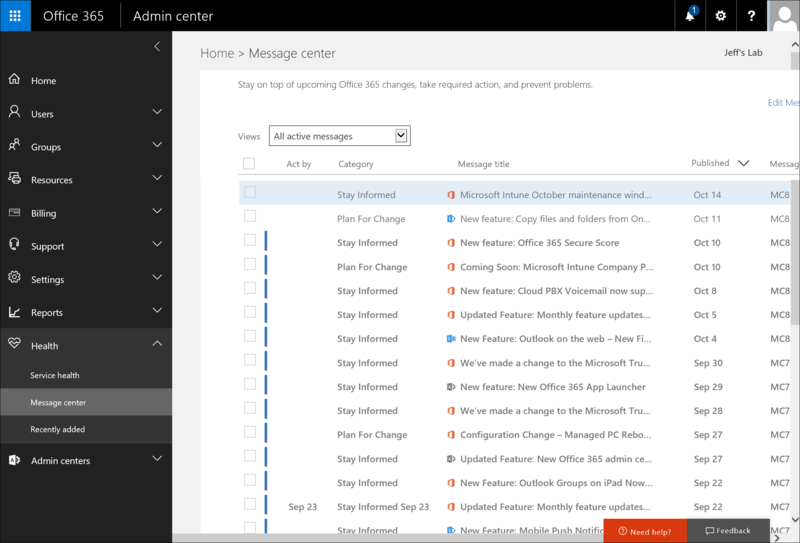 You can learn more about the Office 365 Service Communications API here. 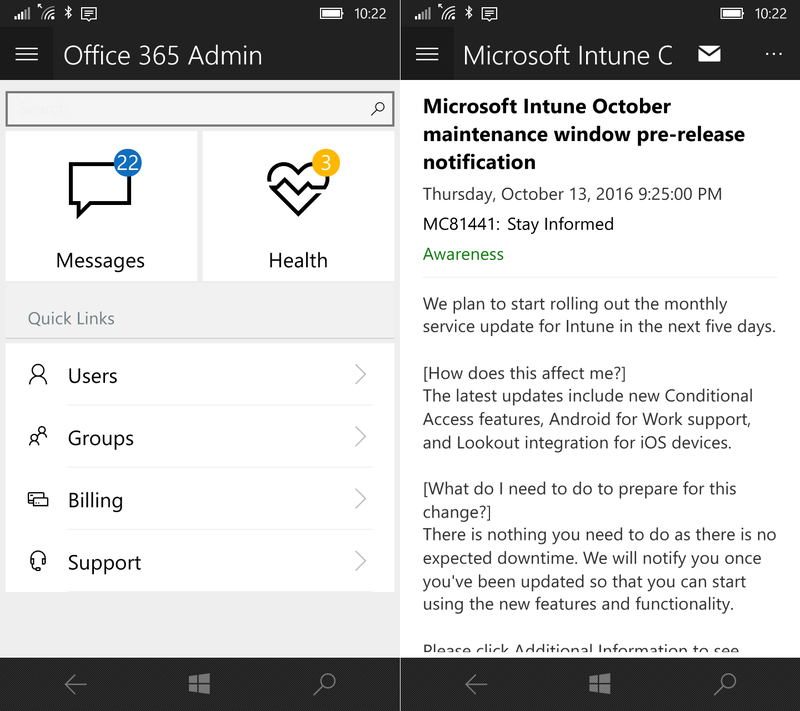 And now you know how to stay informed about Intune service updates.